2017’s Hurricane Irma was one of the most powerful – and costliest – storms the Atlantic region has ever seen. And with an estimated $2.6 billion in crop loss, farmers were some of the hardest-hit victims. But it doesn’t have to be a record-breaking cyclone for the weather to impact the agriculture industry. When it comes to natural phenomena, anything from floods and droughts, to unexpected freezes or drastic temperature swings, can cause farmers to face a tough environment that affects planting schedules, soil conditions, crop yield, product quality and, ultimately, their bottom line. Of course, weather isn’t the only hurdle. The truth is, agriculture is a resource-heavy industry, with high labor costs, expensive and time-consuming distribution chains, and growing consumer concerns with pest control. That’s not to mention the growing global population that will require a 25-70 percent increase in crop output by 2050. This growing need is made worse when considering the shortage of arable land in many areas of the world. Take Japan, for instance, where the 2011 tsunami and the resulting Fukushima radiation led to major contamination of the nation’s farming acreage. There, and in other countries where resources are scarce, the dependence on traditional farming is concerning – it inevitably means insufficient food supplies at extreme expense. Non-traditional farming promises to sidestep many of these challenges. Vertical indoor farming is exactly what it sounds like. Plants are grown indoors via vertical towers or stacks of shelving, using hydroponics instead of soil and LED lighting instead of sunlight. There are a couple of key concepts to recognize here. First, the recent rise in LED lighting technologies – and the associated decrease in cost – has helped make vertical farming more economically viable. Second, while there’s a clear cost saving in eliminating the need for soil, the reduction in the amount of required water is even greater. Bowery Farming, a New York City vertical farm startup, claims they use 95% less water than traditional farming methods. Many indoor vertical farms are housed in converted warehouses or even shipping containers. While the more efficient use of space is already inherent in the fact that these farms are vertical, the resulting environment also yields fast growing times and shorter crop cycles. In other words, these farms can produce significantly more product with substantially less land and time. Plenty, a Silicon Valley-based vertical farming startup, claims to get 350 times as much produce out of a single acre than a traditional farm. Furthermore, these farms are naturally suited to urban areas, which reduces the distribution chain – or “food miles” – between farm and retailer (or even direct to consumer). Unsurprisingly, this results in improved freshness, quality, and taste. When you throw in a growing consumer interest in where food comes from, it’s easy to see why this non-traditional farming concept is taking off. Vertical farming is also trailblazing the way for Artificial Intelligence in agriculture. The indoor environment enables the use of infrared cameras and 24/7 monitoring, which together create an enormous amount of data for farmers about the growing conditions of their crops, such as water, nutrients, humidity, lighting, and more. 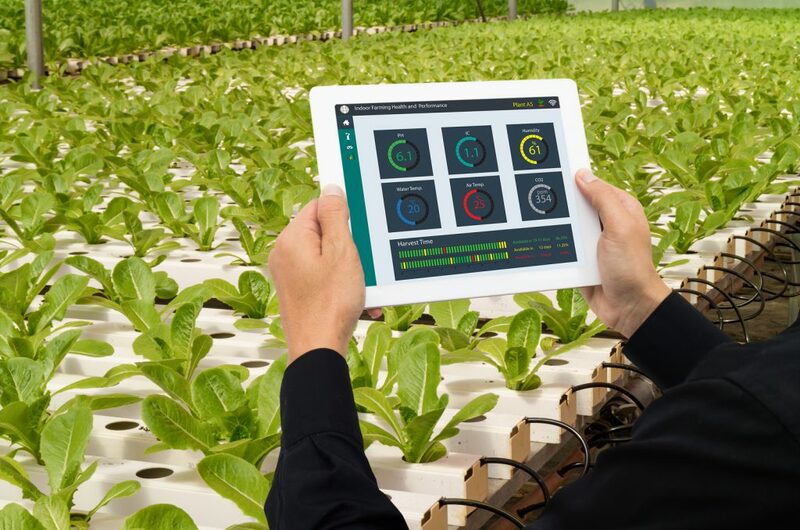 Farmers then use AI and machine learning to draw conclusions about plant health, predict future outcomes, and make automatic adjustments to improve and maintain consistent quality. Underlying all this, but no less significant, are the self-evident benefits to non-traditional farming: No weather challenges, pest problems, or need for pesticides. It’s clear that the benefits of vertical farming are substantial, but it’s still a very new industry. Will it ever replace traditional farming? In short, the answer is no. For the foreseeable future, non-traditional agriculture is still quite expensive – despite the reduction in resources. The costs – and the required knowledge – make it difficult to meet quality standards at larger scales. Plus, the reality is that there are currently limited varieties of crops that can be produced in indoor controlled environments. Products coming out of these farms are often leafy crops like lettuce and spinach, which require the least amount of light to grow. Strawberries, peppers, and cucumbers can be grown too, but at greater cost. Root vegetables, however, simply don’t work in the current setup that most vertical farms employ. As a result, indoor vertical farming isn’t about to take over market share, but rather complement the work that traditional agriculture is already doing. With that said, there is major investment activity in these business ventures. Plenty – which started in Silicon Valley and is now expanding in China – made headlines when they closed the largest ag-tech deal on record in 2017. Their investors include Jeff Bezos and Eric Schmidt, among others. Likewise, Bowery Farming has big-name investors to help them expand nationwide, with support from GV (formerly Google Ventures), General Catalyst, and others. Finally, Kimbal Musk, Elon Musk’s brother, has founded Square Roots, an urban farming startup accelerator in Brooklyn. These are far from the only examples. Between 2016 and 2017, vertical farming investments increased from $36 million to $271 million. It’s a trajectory that will only continue to increase. There is a rich history behind America’s agriculture industry, but the substantial decline is no secret. While farmers made up 38% of the labor force in 1900, today’s estimates of this same ratio is a mere 1.5%. The growth of vertical farming is unlikely to impact that number, but even if it did, the profile of an urban farmer holds little resemblance to those in traditional farming. Powered by AI, automation, big data, and highly technical farming tools, vertical farmers are less likely to be getting their hands dirty and more likely to have titles like data analysts and bio-scientists. Deep knowledge of plant health and physiology is just as critical as in traditional farming, but with the added layer of complex genetic breeding and digitally-driven growing conditions. While traditional farmers are getting progressively older, the landscape of vertical farming is attractive to leaders and visionaries across the generations. Those with a passionate vision for the future will make successful leaders in vertical farming. They will need an acute understanding of how to leverage technology to improve outcomes, as well as a focus on scaling operations without sacrificing quality, and they’ll also need to challenge the assumptions of traditional agriculture. Given that profile, it’s no surprise that some high-profile executives are lured to the thrill of technological innovation in such a traditional industry. Furthermore, these executives have an altruistic draw to vertical farming as a way to solve the growing food scarcity crisis. Most recently, a Vice President of Engineering at Tesla made the move to work at Plenty. Similarly, an Amazon executive signed on with Bowery as the company’s Senior Vice President of Operations. While a career with a high-profile company isn’t a requirement for working at vertical farming startups like Plenty or Bowery, these moves do highlight the fact that industry experience isn’t exactly necessary. Instead, we look for top talent who excel in their functional roles, such as supply chain or engineering leaders. These are professionals who have a vision for the future and who may be described as industry disruptors. Non-traditional farming has a long way to go in becoming mainstream, but for a concept that didn’t even exist just a few years ago, it is incredible to see where it is going.